Clean Eating with NatureBox (delivered monthly) + $5 OFF coupon! Click here –>> $5 off first NatureBox! Where are all my health nuts? You have got to check out this service that I recently discovered and love. 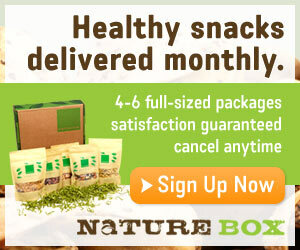 NatureBox.com (a must-have subscription service that delivers healthy snack foods to your door), is currently offering up $5 off your first NatureBox! Every month like clockwork, you receive a box of all natural, delicious snacks which includes 4-6 different types of foods and 15-20 servings of it! Plus, each box is curated and approved by their in-house nutritionists.